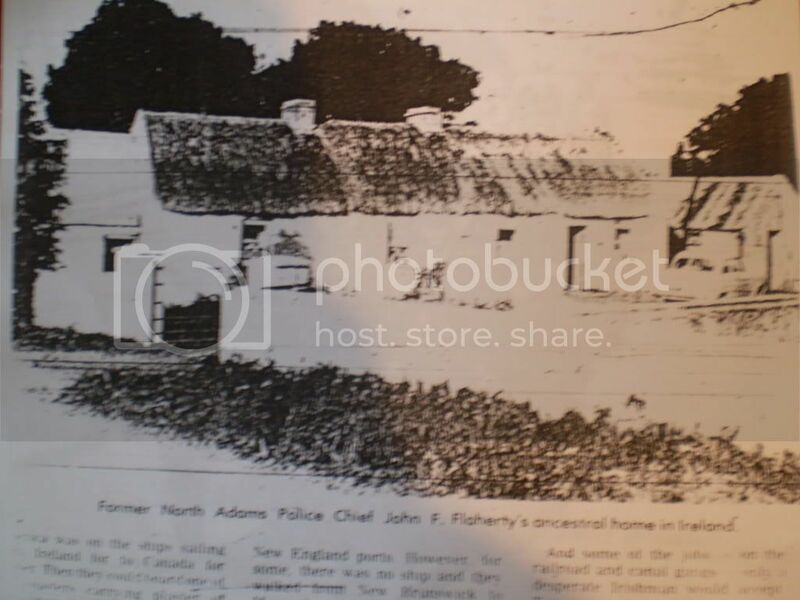 Picture of John F. Flaherty's home in Ireland before his family emigrated due to The Potato Famine. Thanks to the North Adams Transcript from their article " Irish fled Famine in old country for New World and hope" published on March 17th, 1987. St. Patrick's Day. The Irish are known to have strong family ties, hard working motivations, and are highly sociable. With all this going for them you would think that the Irish had an easy time for themselves. The Irish are not only unique in the pride that they carry, but also by the time, and the ways they were carried to the shores of America. Because of their early arrival from the Potato Famine, that pushed them from their island to our shores, the Irish had to deal with discrimination and harassment. Moving beyond their discrimination the Irish worked hard to better the communities they moved into. This website focuses on Irish Immigration into North Adams Massachusetts, and the influence they had on the city.